Back in July, I set about working on a chapter for a book of essays compiled by contributors to The Jesuit Post. My title never varied: I knew I wanted to call my piece "Dispatches from the Control-F Generation." Frequent readers will remember that this is a theme I have written about several times over the past few years. My original submission, however, did not gain much traction with the editors. I used Ovid's Metamorphoses to frame my discussion of technology. 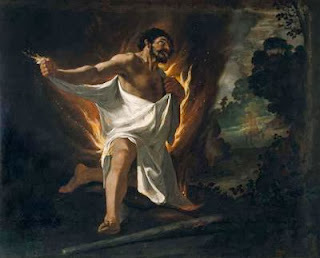 In particular, I tried to develop the image of the "Shirt of Nessus," a shirt soaked with poisoned blood given to the hero Heracles as an unwitting gift that led to his death. The gift, given with the best of intentions, turned out to be the exact opposite of a gift. My sense of our increasingly technology soaked culture was, and continues to be, that we are donning for ourselves and passing onto our children a modern-day "Shirt of Nessus" we believe to be a great gift but, in actuality, is far more deleterious than we realize. Call it confirmation bias, but reading Andrew Reiner's "Looking for Intimacy in the Age of Facebook" only feeds into my suspicion that something is very not right with tech culture. Reiner describes compellingly with a description of growing superficiality and lack of depth among his students. The technology supposed to give students access to the far corners of the intellectual universe doesn't seem to have encouraged any greater depth. Indeed, it would seem as if it has actually contributed to greater social anxiety: his description of his assignment, having students text a friend to share "your true feelings about something this friend has done or said that upset you but that you never said anything about," elicited a fascinatingly fearful reaction. "...texting incites profound cultural unrest. Literally. Recent studies have found that many participants reacted like addicts when separated from their cellphones, while other studies have found that the "sleeping disorders" some high schoolers experience result from cuddling up with text messages all night." I can clearly remember blurry-eyed students coming to school in the morning and, when asked, reluctantly admitted that they'd been texting all night. Bright LED displays with buzzing and chirping alerts hardly makes for the comfort of a teddy bear. When you think about it, if you let your kid sleep with his/her phone, he or she is sleeping with a direct conduit to every other person in the contact list; one adolescent's sleepless night can spread like a contagion throughout an entire network...and who, in this hyper-connected milieu, wants to be the one lame enough to try to get a good night of sleep? His essay is also the first place I've learned of the "Bergen Facebook Addiction Scale." I grant wholly that Facebook may not be the hot locus of social media today - I think texting and twitter are increasing in popularity - but that a scale has been created to rank where one stands on an addiction scale to Facebook is remarkable. He reports that studies show American college students, on average, spend "three hours texting and an hour and 40 minutes on Facebook every day." I frequently feel like I straddle two worlds. I use social media freely but I have avoided developing some Pavlovian reflex to texts/messages/tweets/etc. That is, I don't put my phone on vibrate, it's almost always on silent, and I don't check it all the time. Perhaps it my own resolve to resist the temptation to be sucked into a state of hyper-connectivity that makes me sensitive to others - even brother Jesuits - who do things like check/read email during Mass or can't seem to be on retreat without having a ton of gadgets ready at hand. I share this simply because I feel somewhat vindicated in my generally negative view of technological culture. No question: I'm guilty of bringing an iPad to class and playing games on it when I find myself bored with a tedious lecture or inane commentary from classmates. As I prayed this morning, I actually asked for the grace to have the strength *not* to bring my iPad to a particular class I find to be frightfully boring and Candy Crush seducing. We'll see if I'm able to do it. The final quote of Reiner's essay, from a young woman, says a great deal about the state of affairs we face: "If I don't feel connected with others, I automatically feel alone, unpopular, less confident." For me, this raises the question: how is it that this technology some want to thrust into classrooms in order to make students more engaged learners supposed to militate against this sentiment? Is technology helping to draw students to new heights or is it a false gift, a modern day Shirt of Nessus, increasing feelings of insecurity and anxiety?